Please join the Lillian Goldman Law Library for a book talk with Professor Alec Stone Sweet and Clare Ryan ‘13, ‘19 Ph.D. They will discuss their new book, A Cosmopolitan Legal Order: Kant, Constitutional Justice, and the European Convention on Human Rights. 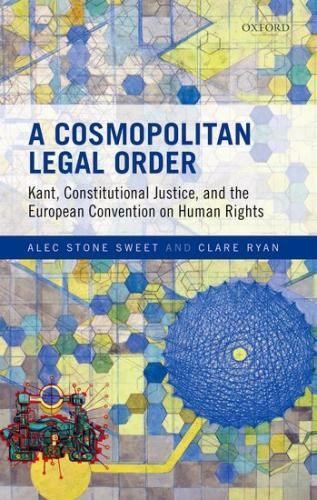 A Cosmopolitan Legal Order provides an introduction to Kantian constitutional theory and the European systems of rights protection. Part I sets Kant’s blueprint for achieving perpetual peace and constitutional justice within and beyond the nation state. Part II applies these ideas to explain the gradual constitutionalization of a cosmopolitan legal order: a transnational legal system in which justiciable rights are held by individuals; of their jurisdiction; and where domestic and transnational judges supervise how officials act. The authors then describe and assess the European Court’s progressive approach to both the absolute and qualified rights. Today, the Court is the most active and important rights-protecting court in the world, its jurisprudence a catalyst for the construction of a cosmopolitan constitution in Europe and beyond. Clare Ryan ‘13, ‘19 Ph.D.